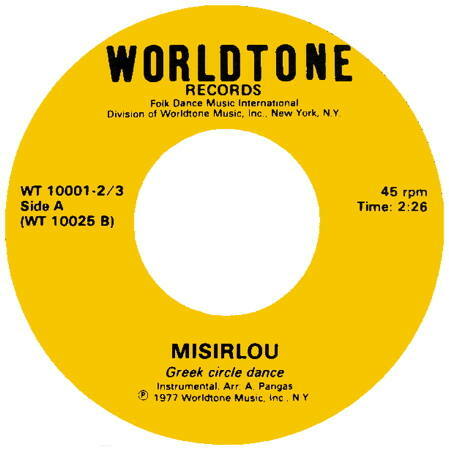 Worldtone Records was distributed by Worldtone Music, Inc. and was located in New York City, New York. 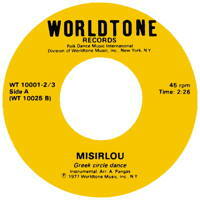 WT 10001  Misirlou / Hava Nagila. WT 10002  Fatiše Kolo / Makedonsko Devojče. WT 10005  Alunelul / Korobushka. WT 10007  Rakefet / Zemer (Nigun) Atik. WT 10008  Sirtaki - Sont of Joy / Song of the Night. WT 10009  Ivanica / Kasapsko Oro. Manet Chune Folklore Ensemble. WT 10010  Russian Two Step / Karapyet. WT 10015  Tzadik Katamar / Boi Tama. WT 10016  Sulam Yaakov / Shalom al Israel. WT 10020  At Va'ani / Ma Navu. WT 10023  Dancing in the Streets / Virginia Reel. WT 10024  Slow Hasapikos / Zorba. WT 10025  Karagouna / Zorba. WT 10026  Chetvorno Horo / Kjustendilska Ruchenitsa. WT 10027  Dirladada / ???. WT 10030  Karagouna / Harmonica. WT 10040  Mayim / Im Hoopalnu. Israel Folk Dance Orchestra. WT-LP-64-701  Songs and Dances of Yugoslavia. YT-YM-001  Batuta / Izručanka.